In 1974, as a high school junior in a “blue-collar ghetto neighborhood,” David Sisson delivered pizza. But on the side, he designed and fabricated artificial limbs. They were carved from a block of wood, and he made adjustments with sandpaper and a chisel. Since then, prosthetics has taken huge strides. After receiving his college degree – he was the first in his family to do so – David Sisson founded the Sisson Mobility Restoration Center, Inc. in Madison, Wisc. There, he implements personal, customized treatment for amputees, war veterans and victims of physical abuse. He records their information using no measurements: only his hands and plaster. In his 37 years of treating more than 10,000 amputees, he’s learned a thing or two about the process. How he got the job: I was working as a pizza delivery boy, and one night, I was delivering this girl’s weekly Friday night pizza pie. She opened the door, and a there was a huge guy holding a 45-caliber gun in the room. I said, That’s it, I quit. My high school had posted an opening for a prosthetic technician, and the pay was better than my rate as a pizza delivery boy, so I applied. I started sanding wooden legs in shop class. Why did you start your own center? I’m a terrible employee. I was raising a family in Madison, Wisc., so I tried to buy the business I was working at. They wouldn’t let me, so I started my own business. Do you mostly order devices from a catalog? I’m old school, so we make about 98% of what we use. If you’re missing it, I make it – externally, that is. But a majority of prostheses are below the knee, due to the diabetes epidemic. Are diabetes-related injuries increasing? Yes, and patients are getting younger. Most of diabetes patients used to be over age 60, and now it’s more like age 40. What’s the process of creating an artificial limb? It’s more art than science. After someone loses a limb, it takes about a month to heal from the surgery. Then, we squeeze out any built-up fluid and take a cast of the stump for accuracy. Finally, we sculpt a plaster cast and make sockets depending on the person’s age and activity level. Most important part: The quality of the socket [which connects the prosthesis to the stump]. If it’s not comfortable to wear – if it hurts to walk – you’re not going to use it. Coolest moment of your career: I was in the film The Fugitive alongside Harrison Ford and Tommy Lee Jones for about two seconds. I created the prosthesis for the one-armed man. People don’t realize: There are many more amputees in this world than you’d expect. Many always wear long pants, so you can’t tell. Do you have any special techniques? I don’t take any measurements – I just use my hands and plaster impressions. I’ve seen 10,000 amputees in my 37 years, and can record lots of information by feeling soft tissue and bone structure with my hands. What materials are used for the artificial limb? Heat foam with aluminum and titanium fittings. Sockets are made of fiberglass, carbon fiber, and other materials. We attach limbs with suction instead of leather straps, which is how it used be. Once the limb is replaced, can a patient return to everyday life? It takes anywhere from six to eight weeks for the soft tissue to remodel itself and heal internally. It can also take that long for patients to get used to the stresses and strains, so physical therapy can be very beneficial. Are the limbs water-resistant? Most are not, although we can specially design them to be. Some people develop a closet full of limbs over the years, so they’ll use an old foot or leg to go in the water and then throw it out. What if you don’t have a closet full of limbs? Tie a garbage bag around your thigh – or wherever the stump is – to keep out the water during a shower or bath. How has modern technology advanced your work? Patients are running marathons and going back into active combat wearing prostheses. 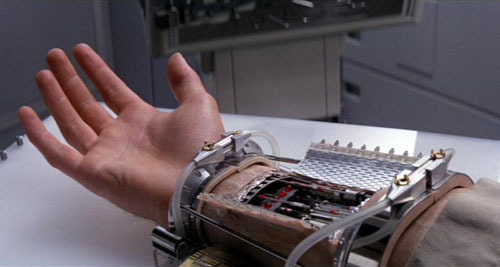 Luke Skywalker’s replacement hand in 1977 had fingers that moved independently, and we thought that would never happen. Now, we create hands with five motorized fingers. Hardest part of the job: Every amputee is different, and people have lists of expectations. They can get very hung up on cosmetics and appearances. Are you more protective of your kids because of the injuries you witness on a daily basis? No. My older son broke his arm twice in one summer, and I was in the emergency room with him, but was kind of jaded. I’ve seen people ripped in half, people missing halves of bodies from electrical burns. So I wasn’t too overwrought over a broken arm. You also work with amputees in third-world countries. A group called Healing the Children provides medical care to children in need. When the group traveled to Nicaragua, they brought back some cases they couldn’t take care of. 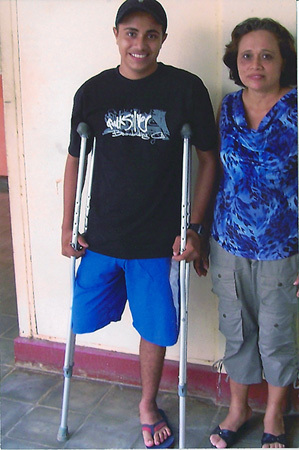 I made several prostheses for boys who had suffered machete injuries. That must be incredibly rewarding. Yes, but it’s essentially a bait-and-switch for young kids. You can give them a new leg, but if they need minor repair, they don’t have the three cents for a bus ride into town, much less the two cents for a new rivet. There needs to be an infrastructure where someone is on-site, in the matrix of society in these third-world countries. Something people don’t know about you: I grew up a blue-collar ghetto neighborhood, and am the first in my family to receive a college degree. Also, I’m left-handed. Have you used your skills outside of working with patients? [Using my hands] also comes in handy with making costumes. I helped make props and set pieces for my son’s school performance of Aida and a local theater group’s performance of A Christmas Carol. Best lesson learned? You can decide a prosthetic limb is just one more challenge in your life. Or you can do the best you can with what you’ve got. Want a future in artificial limbs? Dave Sisson gives you a leg up. 1. Visit a local limb shop and ask the prosthetist if you can shadow him or her for a few days. Some parts of our job are kind of gross, so you need to make sure it suits your sensibilities. 2. The American Board for Certification in Orthotics, Prosthetics and Pedorthics offers many resources, including the curriculum for individual certification and continuing education courses. 3. What I do is very abnormal, so part of the process with new amputees is developing a language with each patient so he or she can describe how they’re feeling. You must be able to communicate with folks. Click here to listen to patients’ testimonials from the Sisson Mobility Restoration Center. Have you or a loved one ever lost a limb? How long did it take to readjust? Comment below!